Monica and Jimmy tied the knot at Scenic Springs a little ways out of San Antonio, in Helotes, TX. 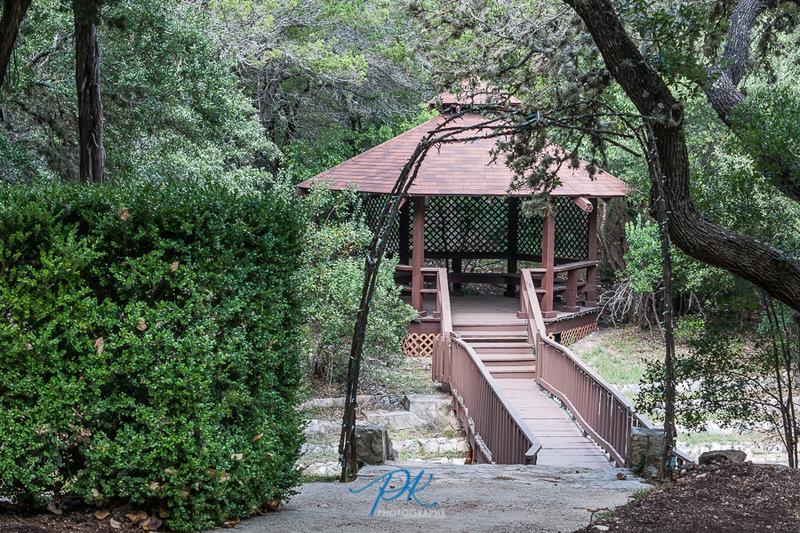 The venue was surrounded by woods with a beautiful gazebo accessible by a bridge over a stream. Of course Monica wanted to do their first look under this shaded gazebo, and Jimmy tried to hide his tears when he saw his beautiful bride for the first time. Meanwhile, the guests were all arriving and heading for ceremony. In place of a traditional guestbook, Monica and Jimmy had a Polaroid camera guests used to take images of each other to put with a handwritten note in a scrapbook. It was so much fun watching the guests joking around with each other as they were in control of documenting a piece of the day. The ceremony and reception were in the same room, and everything flowed perfectly. Family, and close friends sat in the chairs set up around the center aisle, and the rest of the guests were seated at the reception tables. Their ceremony was short and very touching, and they included a moment of silence for loved ones who had passed on and couldn't be present. We did a few portraits after their ceremony with close family and friends, before jumping into their fun wedding reception! Dinner was served followed by the cake cutting, and dancing. The evening continued and ended with such a close-knit atmosphere of love and unity, it was an honor to be present and able to photograph such a beautiful event in these two beautiful peoples' lives. The corsages chosen were different from the other flowers, yet blended in perfectly. Monica wore simple and gorgeous earrings on her wedding day. Monica's bridal bouquet was such a beautiful combination of her wedding colors. To say Monica was happy on her wedding day be an understatement. Monica and Jimmy included family members who had passed on by having both a moment of silence at the start of their wedding ceremony and charms on her bridal bouquet. These Michael Kors heels completed Monica's bridal look. Monica's mother requested a classic bridal portrait of her, and I'm so glad we were able to showcase Monica's timeless wedding look. 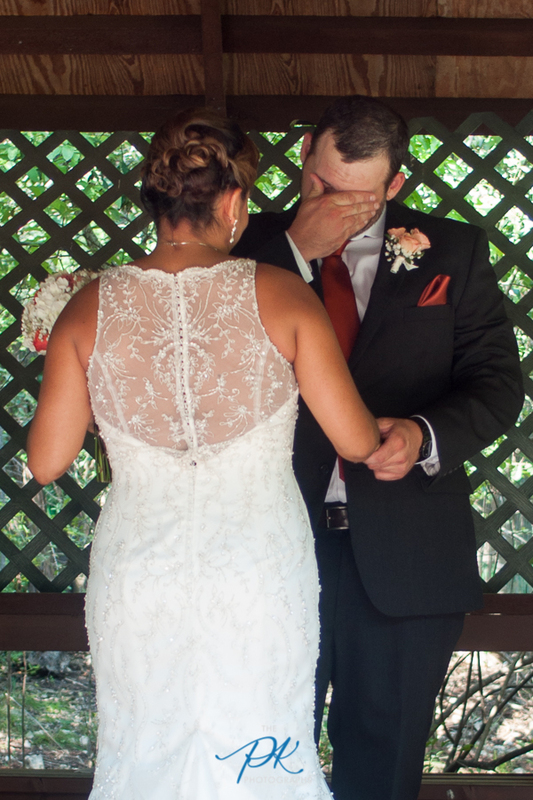 Jimmy couldn't hold back his tears, seeing his bride for the first time. 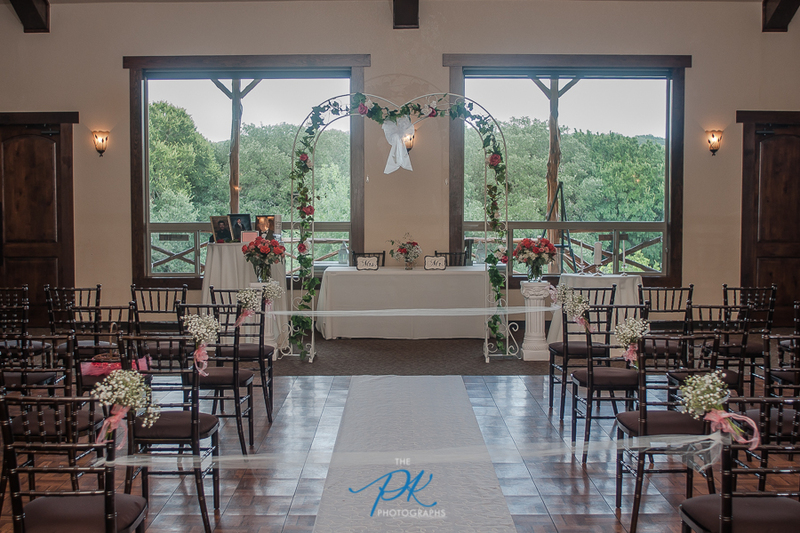 This beautiful gazebo was perfect for Monica and Jimmy's First Look on their wedding day. 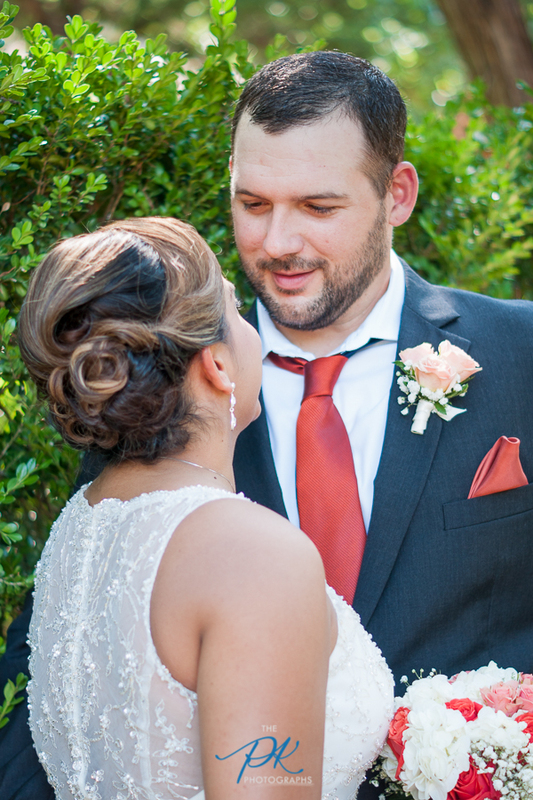 Monica's hair was stunning, and a perfect choice for a summer wedding in Texas. Monica and Jimmy held their ceremony and reception at Scenic Springs in Helotes, TX. The quaint ceremony was overlooking a picture-perfect wooded lawn, complete with a strutting peacock. The wooden flower girl baskets were decorated with tulle. The musicians did a wonderful job setting the mood for the wedding ceremony. The aisle was decorated simply with this beautiful white flowers. Their guests loved this unique guestbook! Monica walking up the aisle to her soon-to-be husband. 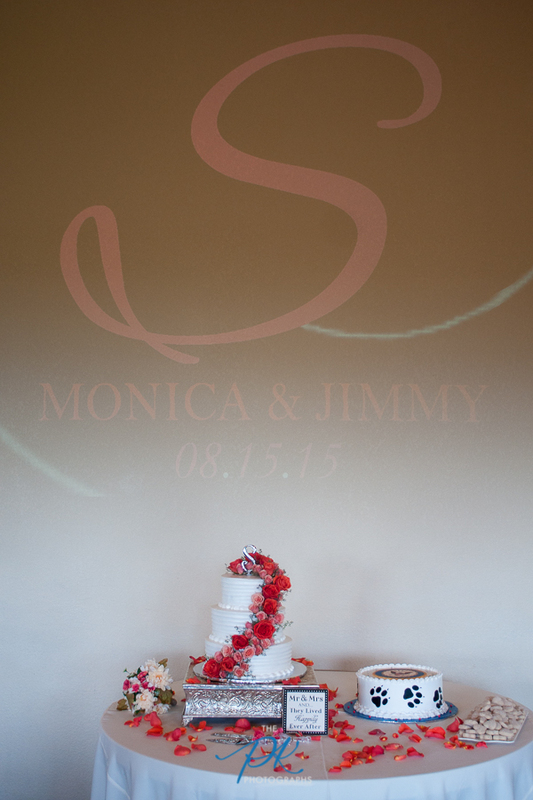 The love and support for Monica and Jimmy filled the room during their wedding ceremony. Monica and Jimmy's mothers lit their candles as part of the Unity Candle Ceremony. Standing under the archway to say their wedding vows. There was no hesitation when the long awaited phrase rang out, "You may now kiss your bride". Finally husband and wife, Monica and Jimmy were all smiles heading back up the wedding aisle! The bridal party relaxing as we did the formal family portraits with the Bride and Groom. Monica casually strolling down the stairs as we headed out to take some photographs of her and her new husband. Monica and Jimmy during a private moment on their busy wedding day. The reception tables were decorated with burlap and lace, beautiful mason jars, and had quite the country feel. The decor on their tables was simple, yet so beautiful. The bride and groom included their initials on the centerpieces on their reception tables. Above the cake table at their reception was their last initial, their names and wedding date. How beautiful is this wedding cake? Where there is cake, there must be coffee! The waterfall effect with the flowers really tied everything together. Wedding toasts are such a fun way for all the guests to learn little known facts about the bride and groom. One of my favorite things about Texas weddings? Mariachi bands! Wedding rings are as unique as every couple, and equally fun to photograph! Monica and Jimmy were all smiles during their first dance! They were also all smiles during their cake cutting! How beautiful are this bride and groom! Everyone got a turn dancing with the bride, including the flower girl! Now that the ceremony is over, the bridesmaids were able to relax and party the night away!